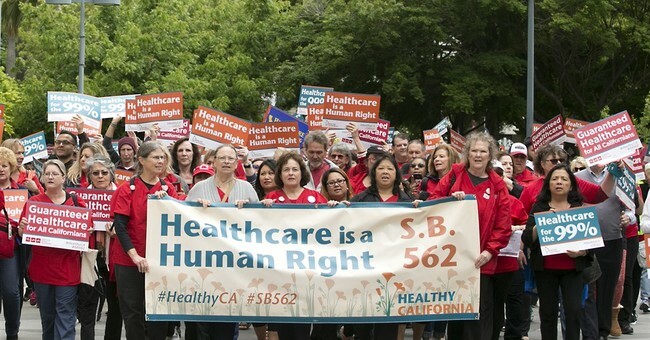 California has been considering a single-payer healthcare plan. S.B. 562, the "Healthy California Act," is currently in committee, and today the numbers came out on what it would cost to actually make this plan a reality. According to analysis of the bill, it would cost a cool $400 billion to provide for the healthcare of all California residents. S.B. 562 would cover residents in California regardless of their legal status. If the bill were enacted, healthcare would be entirely free and there would be no deductibles, co-pays, or premiums--entirely free care. One tiny, insignificant detail: there's no way the state can afford this. California would have to raise an additional $200 billion in tax revenue just to pay for the Healthy California Act, although there's nothing in the bill that would create a tax that to actually raise the money to pay for the care. It was suggested that a 15 percent payroll tax would provide revenue for the bill. Perhaps unsurprisingly, the cost is being labeled as the "biggest hurdle" to universal healthcare coming to California. Vermont faced similar issues with its own proposed single-payer healthcare system, Green Mountain Care. The plan was scrapped when it became clear that enacting a single-payer system would effectively bankrupt the state. Despite this, at least one gubernatorial candidate in the Golden State are still clinging to and promoting the idea that a single-payer system is somehow both feasible and a good thing for California.